I was hoping to have a nice post today, with lots of pictures and things I’d been doing this autumn in the garden. Nope. Life has been busier than I expected between family things and preparing for NaNoWriMo. So, today, I’ll just talk a little bit about my garden, and how it came to be. Eating healthy and living sustainably has always been a dream of mine – I spent a lot of time outdoors as a child, and I have a long-held fascination with nature and animals. I started following a few Pinterest boards about gardening, and stumbled across this thing called urban farming. And then I discovered this thing called Back to Eden. BACK TO EDEN FILM shares the story of one man’s lifelong journey, walking with God and learning how to get back to the simple, productive growing methods of sustainable provision that were given to man in the garden of Eden. The organic gardening system that has resulted from Paul Gautschi’s incredible experiences has garnered the interest of visitors from around the world. However, never until now have Paul’s organic gardening methods been documented and shared like this! It perked my interest, partly because I’d recently been working on a short story that was the retelling of the fall of man in the garden of Eden, but from Eve’s point of view. So I was on high alert for anything with the name Eden in it, and soon realized I’d stumbled across a gold mine. The first time I watched the video (which is available for free online at the website above, or you can purchase it on DVD for $15), I nearly cried. I’d gardened before, and it’s hard work, especially in Oklahoma. We can have highs in the 80s (Fahrenheit) during the day and dip down under freezing at night, especially in spring and autumn. Or in summer, when we have blistering heat, and often drought conditions. Back to Eden gardening is so simple – really, it’s just aggressively mulching. Wood chips are best for this, they break down eventually (and feed the soil to create beautiful top soil), so it does have to be replenished every few years. It doesn’t require any tilling, and if done correctly, helps control weeds. I will say one thing, though, about the weed control – this method was developed in Washington state. They do not have crabgrass up there like we do here in Oklahoma. The method of laying newspaper down underneath the mulch to smother the weeds does not work on crabgrass. You need to dig the crabgrass out from the roots, and aggressively weed the borders for a few years to keep your plot crabgrass free. I did not do this when we put the garden in last spring. I pretty much have to start over now, because the crabgrass won over the summer. That said, you know what I didn’t have to do at all this summer? Water. I didn’t water a single time. There were a few times I thought about it, when we’d have a stretch of more than 1 1/2 – 2 weeks without rain. But every time I pulled the mulch back around my tomato plants, the soil beneath it was still damp. Now, we did have a milder summer this year than we’ve had for the past, say, five. Temps rarely went over 100 F degrees. We had rain several times a month. For comparison, two summers ago, we had temps near 120 F for several weeks straight. And very little rain. I had tomatoes coming out my ears. I harvested 7 lbs of peas (this is… not counting the ones we ate pretty much straight off the plants). My asparagus crowns are in the ground, and we should have a massive crop of that next spring. My peppers… well… I think my cayenne peppers cross-pollinated with my bell peppers… and… yeah, those didn’t turn out so great. Better luck next year! So this next time around, we’ll be digging out the crabgrass. I’m not sure I’m going to actually get a spring garden in this next year, it may be an autumn one in 2014. I have to find a way to control the crabgrass first, and I don’t have the time or energy to dig out all the grass before winter hits, since our temps have already started dipping down low, and NaNoWriMo is imminent. But even if I have to battle crabgrass eternally, the fact that I didn’t have to water a single time is enough to convert me to Back to Eden gardening. 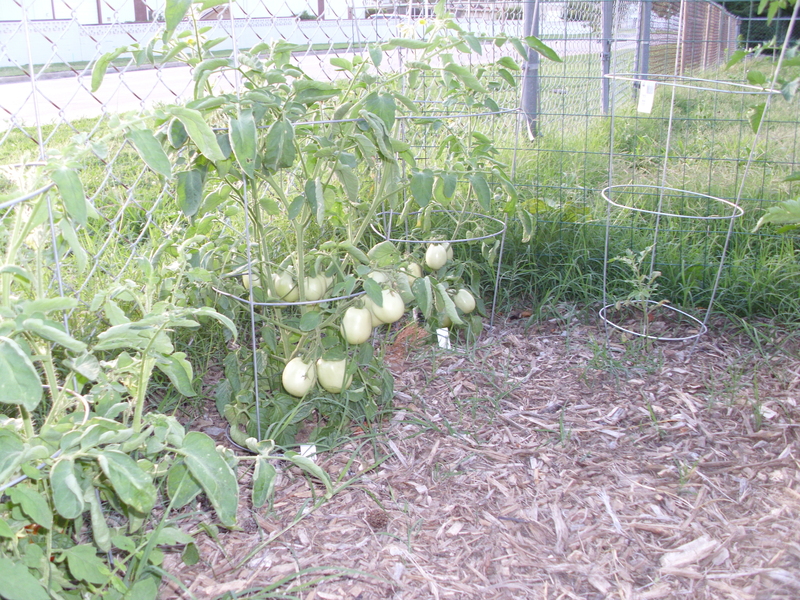 The tomato portion of the garden… before the crabgrass took over. I finally started my NaNo last night. I guess I have a lot of catching up to do. I’m going to watch the video, but maybe after November. In SC we have a lot of crabgrass too. The newspaper trick definitely doesn’t work. This year I tried thick cardboard boxes, and put very old pine mulch on top, nearly a foot thick, though after the rain compacted it, it was about 5 inches thick. I had very little weed problems there. On the other hand, after I ran out of boxes, and used grass clippings, I did have a good bit of grass pop up there. I used Ruth Stout’s method at that point, and I just picked up the clump of grass and its roots and flipped it over, exposing the roots, and in effect composting the grass. Also, I still had trouble with grass invading edges whether I used cardboard or not. Below the cardboard, the ground is hard, but grass free. Below the grass clippings, some of the grass is still there, but did not grow this summer. On the other hand, where I dug a trench over a foot deep and filled with pine mulch (which was still old, just three years less old than now) I only had a few weeds show up this year, in spite of the bed being neglected for three years. Hey Heather, glad to hear from you! Hope NaNo is going well for you so far. I may try some of those tricks for the crabgrass, thanks for the suggestions!